What is true colloidal silver used for, how to use it and does it work? There are many advanced colloidal silver uses and benefits. Colloidal silver products may include uses as a colloidal silver dietary supplement. Recommended supplement dosage is 1-2 ml twice daily or as directed by a physician. 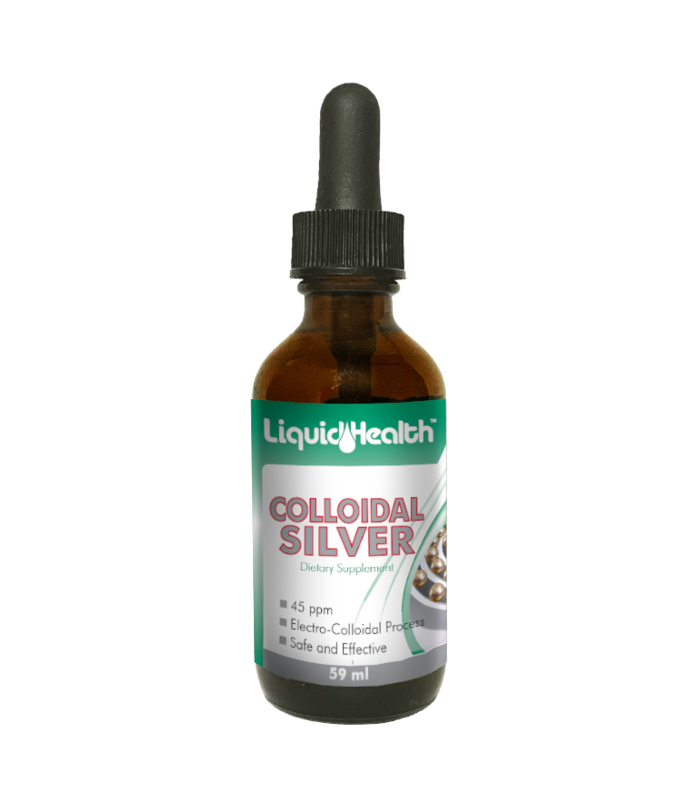 Liquid Health has been making liquid colloidal silver supplement solutions with minerals for years so we know how to make it safe and effective. Colloidal silver water liquid is much more effective than as a colloidal silver nasal or throat spray, cream or gel, since it can enter the blood stream more quickly and efficiently. Recommended Use: 1-2 ml twice daily or as directed by a physician. Ingredients: Colloidal Silver 45 ppm in a base of distilled water. ** Daily Value Not EstablishedWarnings: Pregnant or lactating women, diabetics, hypoglycemics, and people with known medical conditions and/or taking drugs should consult with a licensed physician and/or pharmacist prior to taking dietary supplements. Do not exceed recommended dose without proper blood monitoring.CONTAINS NO SUGAR, STARCH, SALT, WHEAT, GLUTEN, YEAST, MILK, OR SOY DERIVATIVES.THESE STATEMENTS HAVE NOT BEEN EVALUATED BY THE FDA. THIS PRODUCT IS A DIETARY SUPPLEMENT AND IS NOT INTENDED TO DIAGNOSE, TREAT, CURE, OR PREVENT ANY DISEASE.This product is not meant to replace competent medical advice. Individuals taking prescribed medications should consult a qualified health care professional.ALL Liquid Health™, Inc. Products MADE IN THE U.S.A.
Children’s Multi is a liquid multivitamin blend of whole foods designed to provide the vitamins, minerals, trace minerals, and amino acids for growing bodies. The base of pure aloe vera juice is loaded with digestive enzymes. Sea vegetables, dubbed nature’s perfect food, provide most of the vegetarian nutrients in this well-rounded formula. Our aloe vera juice is cold-pressed, leaving the nutrients intact and the enzymes active. Stevia, a naturally sweet Paraguayan herb, is used for its beneficial properties. Liquid Health’s Complete Multiple is an all-inclusive complete daily liquid multivitamin. It has been reformulated to maintain its place at the forefront of liquid nutrition with a full list of liquid vitamins, minerals, and supplements to benefit your body. This complete multi liquid vitamin formula is one of the best liquid multivitamins on the market today.